What Can I Do With an Old Pair of Scales? 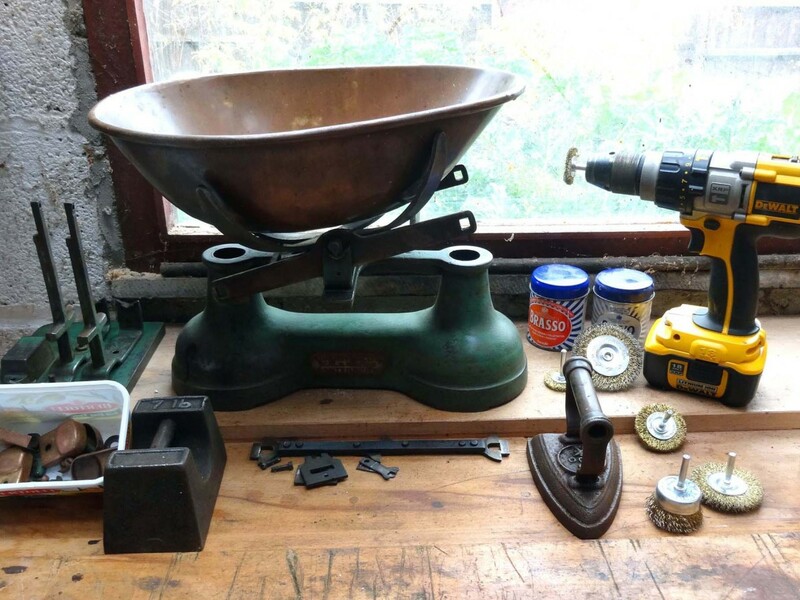 Restoring an old pair of scales is not as hard as it may sound. 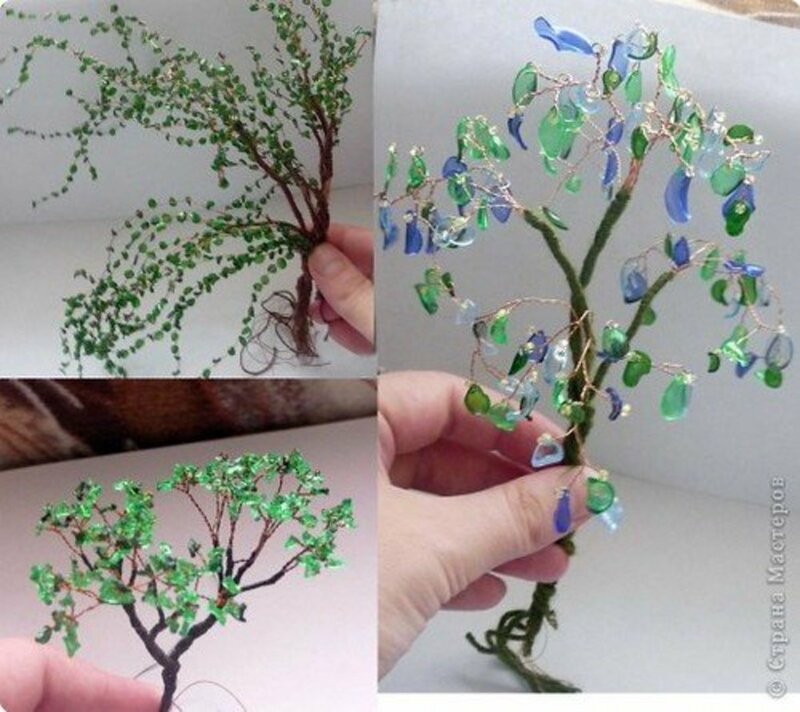 Once you're finished, they would look great and function well in the kitchen. However, if you have modern digital scales, you may not want an old pair of scales taking up valuable kitchen space. My solution was to repurpose them as a fruit bowl in the dining room. Here is how I restored and repurposed an old pair of scales given to us by a friend after clearing out his garage. 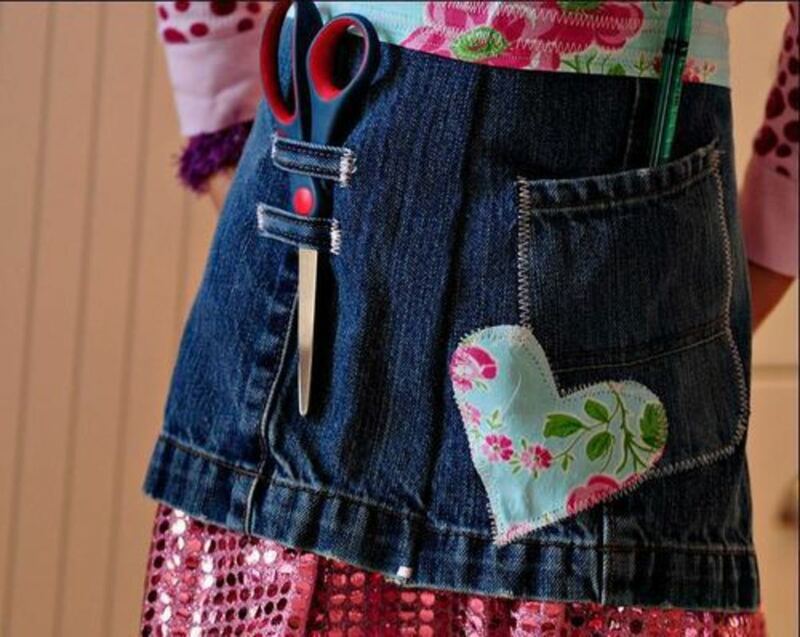 This DIY makeover project provides a few simple tips and ideas. Enjoy! 1. Undo all the nuts, bolts, and screws. Make a note of where everything goes and how it fits together. All of these came undone quite easily except one screw on the underside that required a good soaking in WD40 before it would loosen. 2. Give all the parts a good wash with warm soapy water and a good scrub to get rid of any surface dirt and grease. If at this point the scales come out clean and all the paintwork is in good condition, that's great: All that's needed then is to dry the parts off and reassemble it ready for use. The scales we were given had surface rust, so the paint work was patchy. I ordered a set of wire brushes to fit an electric drill and used them to clean off the rust, making the surface smooth and ready for spray paint. 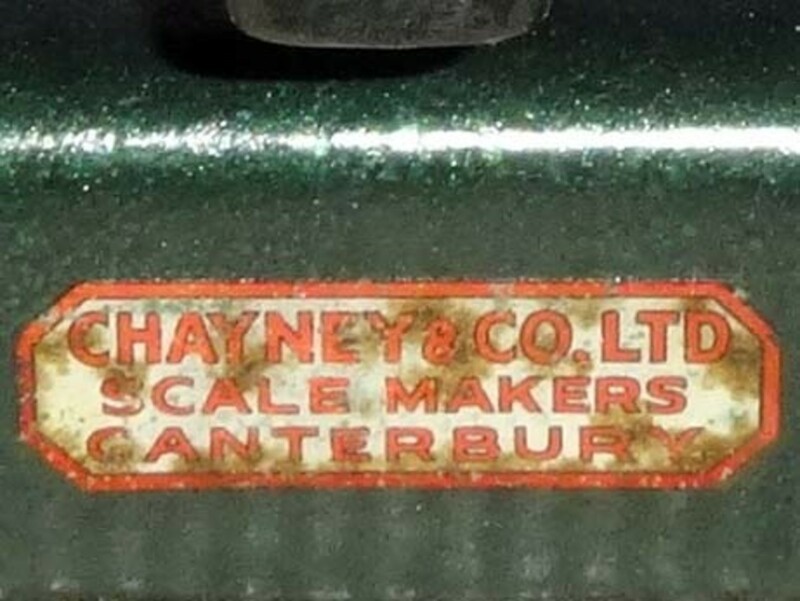 Manufacturers Label on side of scales (Chayney & Co Ltd, Scale Makers, Canterbury). I was keen to preserve the manufacturer label in its original state, so when I used the wire brushes to clean up the metal work, I switched to using a Dremel with a wire brush around the manufacturer label for greater control. Carefully inch your way towards the label, getting as close as you dare without any risk of damage. To protect it when spray painting the rest of the body, carefully cut a strip of electric tape to size using a Stanley knife, which is particularly useful for cutting beveled corners. Stick the electrical tape over the label. As demonstrated in the image of the label after the scales were painted shows, it pays to take your time and pay attention to detail like this. Scales repainted with green car spray paint; closely matching the original colour. Only the body of the scales and any parts previously painted should be repainted with car spray paint. The bare metal parts just need a good clean in soapy water. The brass and copper pieces, including the weighing scoop, were polished up with Brasso. The scales weighing platform, although solid iron, I polished off with a good rubdown of Silvo. I couldn't find an exact colour match to the original, but I just wanted it to look good as a showpiece so that I could repurpose it as a fruit bowl. I found a green car spray paint which was a reasonably good close match to the original colour. I spray-painted the scales without a primer and found that one small can was just sufficient for two coats. Although not using a primer worked fine, if you tackle a similar job, using a primer is something you might wish to consider. Not being able to find a suitable set second hand, I bought a new set of weights that weigh up to 2 kilograms, of which the largest weight is 1kg. Although not original, this is ideal for my purposes. With the smallest weight being 5gms. I can get some accurate readings from the scales. I recently tried them out with the newly restored scales when I harvested 980grms of Brussels sprouts. The weights worked a treat! Also, as the weights stack, they take up little space when not in use and become a display item on our sideboard. 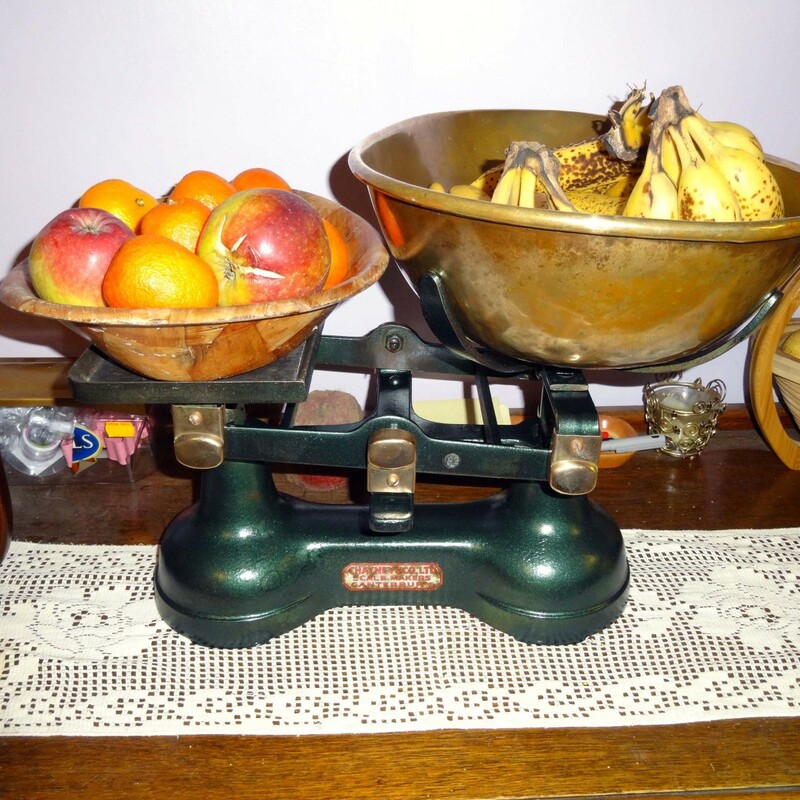 Renovated scales in pride of place on the sideboard as a novelty fruit bowl. Display the Scales in Style! We put the restored scales to practical use on our sideboard. Not only does the weighing pan make a natural fruit bowl, but placing a fruit bowl on the weighing pan doubles up its use for keeping fresh fruit. It's fun watching the scales over the days as one side becomes lighter than the other and the balance in the scales is tipped from one side to the other—only to be reverted as the fruit bowls are topped up with fresh fruit. 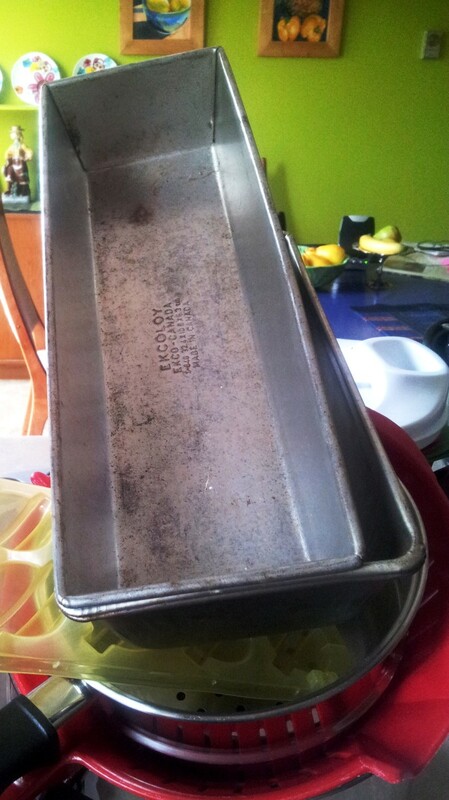 We were given an old pair of scales, with one original weight that was seven pounds. 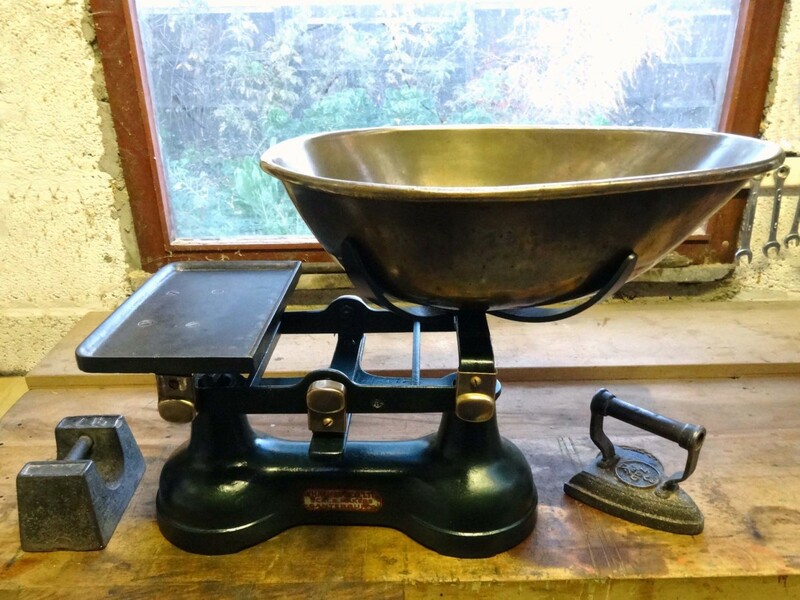 The scales had been stored in the back of a friend's garage for years and were in a bit of a sorry state—decades of grime and paintwork marked with a touch of surface rust. Nevertheless, I saw potential in these not just for weighing vegetable crops I harvest from our back garden but also to multipurpose as a fruit bowl. Being almost self-sufficient in growing our own vegetables, it can be quite a chore weighing them on modern kitchen scales for our records. 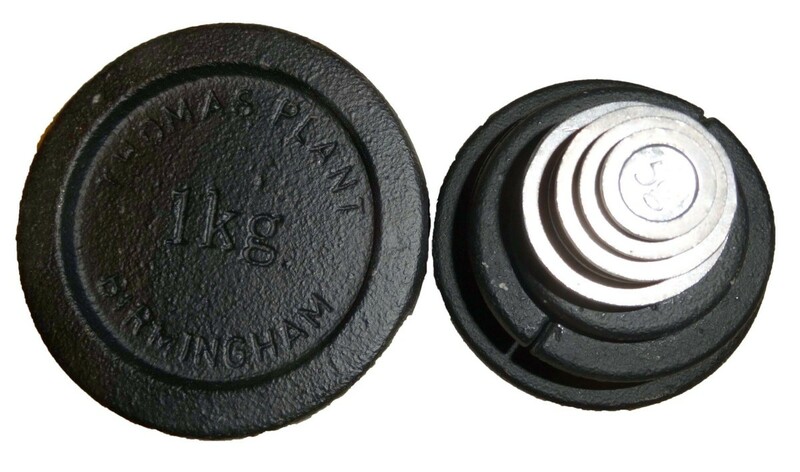 A proper pair of scales like these, provided I could obtain some new (or second hand) weights, would be ideal. Before embarking on this project, I wanted to learn more about these scales, their history, and their worth. I discovered that these particular scales, as identified by the manufacturer plate fixed to them, were made by Chayney & Co. Ltd, Scale Makers in Canterbury; the full address being 50 Burgate Street, Canterbury, England. This company, which was bought in the 1950s by Vandome & Hart, has its roots in a Thomas Sinclair Chayney, who appears in the 1882 Kelly Directory as scalemaker at 7 Market Buildings, Maidstone, Kent. Further research revealed that Chayney and Co. appears as Scale Makers at 50 Burgate Street, Canterbury from about 1917. Therefore, I assume that these particular scales were manufactured sometime between 1917 and the 1950s. And although classified as vintage scales, their value at best is only £50. My intention in renovating them was to strip the paint back to the bare metal and re-paint with car spray paint of a similar colour. 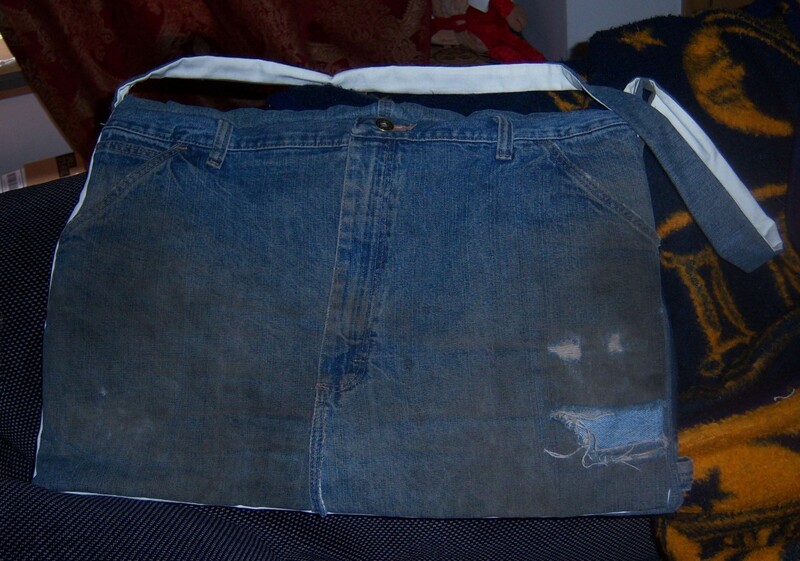 Obviously, this would strip the scales of their original authentic finish and thus their value. However, at £40 or £50, it's not a great loss. I am sure that if I were to sell them in their restored state as an attractive pair of scales (if not as a collector’s item in its original state), I could get £20 for them anyway. 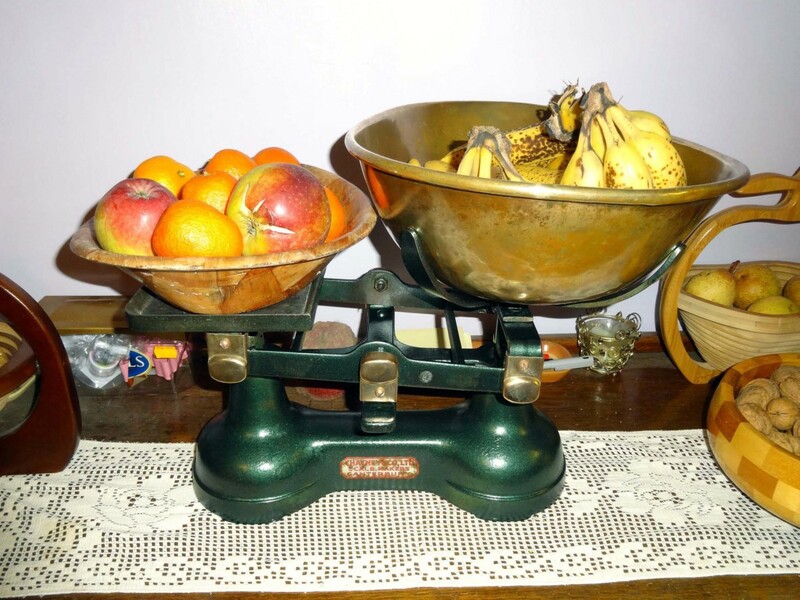 If you had an old pair of scales would you multi- purpose them as a fruit bowl? 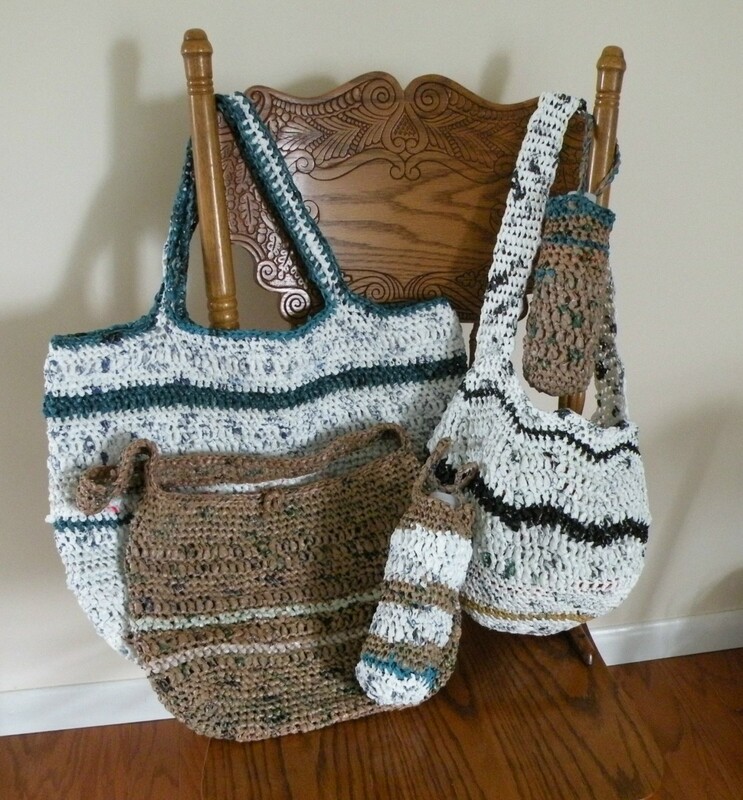 Yes, I love the idea of multi-purposing. Thanks Mary, I agree, knowing the history of anything around the home always gives it more meaning. We have one that we just hanged in our cottage. This is a great idea. Your giving its history made it more interesting.